English translation: “You can know one thing and don’t know other things. ” It means that nobody is universal. English translation: “A woman is like a snake, as soon as she gets her head out, make it go inside again”. It means that it is wrong to give too much freedom to women. English translation: ” A beautiful woman is the one with a child in her back”. This is related to the value of motherhood. English translation: ” When a chief gives you a mat, sit down only on one small corner.” It means that you need to be careful when a boss asks you something. English translation: ” Eating with the two hands will fill you up quickly, however the hunger is coming back faster. It means that if you get rich too fast, you also get poor very fast. English translation: “It is the one that know us that is less gentle with us. ” It means that this person can harm us easily because this person knows our secrets, our weaknesses. 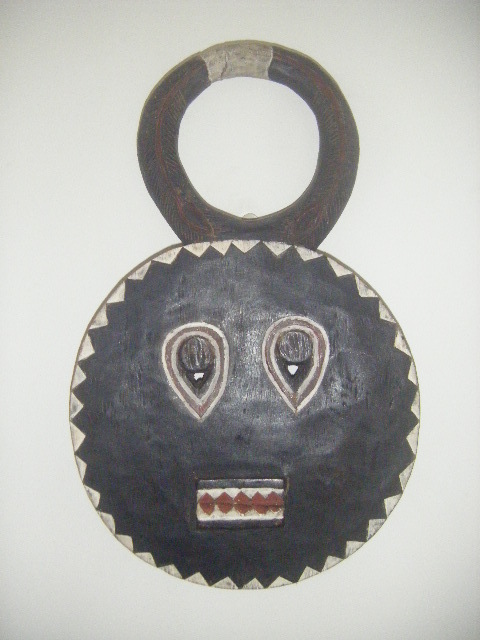 The Kple Kple mask is from the Baoule community in Ivory Coast. The face refers to the sun, and the sunbeams are represented by polychromed triangles.This type of mask is usually used in commemorative, agricultural and burial ceremonies. 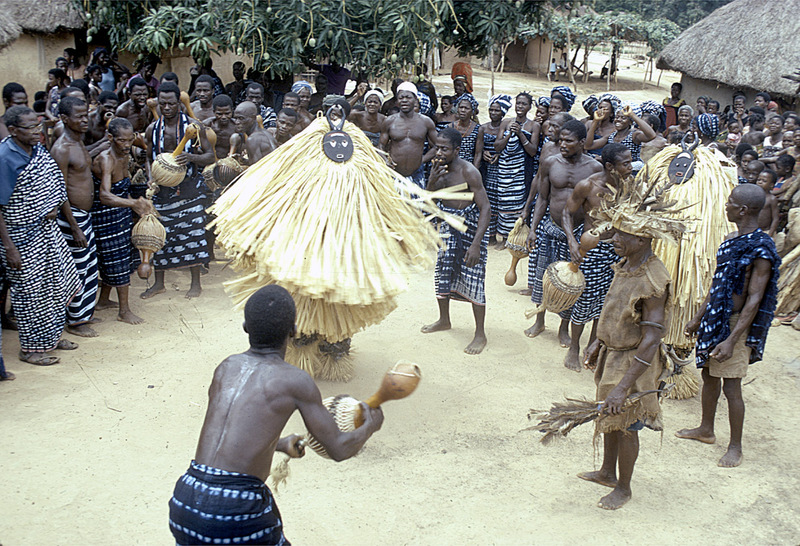 The mask would generally be worn with a raffia (grass) costume attached to the lower section of the mask reaching to below the waist with a grass skirt and other grasses covering the body and legs. Below you will see an image of a ceremony when the Kple Kple mask was used. After few months of silence,Myafrik’art is back on ebay and also we are back on the blog to write more about African art. This break allowed us to make intensive research in relation to African art. So stay tune! 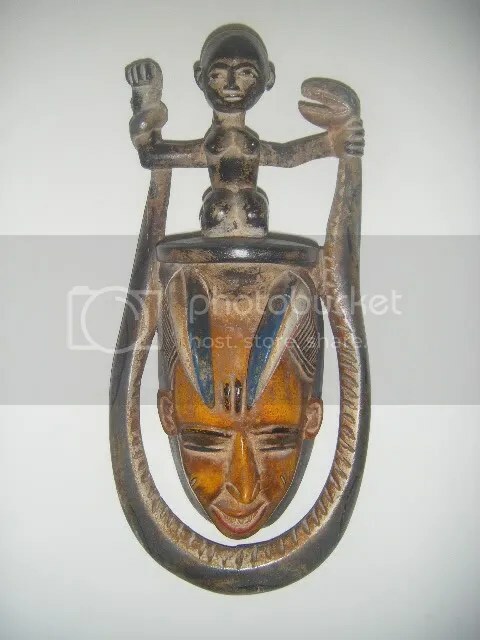 – Promotion of handmade African art and craft (all the items are directly bought by us in West Africa and we have a trustful relationship with our suppliers). -Mix between traditional African art and current African art. We are against the looting of African art in Africa. Therefore all our items are made in a traditional way but we also know that nobody had to be chased away from his/her village because of our pieces. Too many people that think are interested in African art want the special piece that was part of a ceremony as they think that it is the only real African art . It happened many times to my friend before. Some people will criticize his items telling him that they are fake just because they wanted this special piece. However all these “not so smart”people tend to forget that because of poverty, sometimes some young boy or girl in a village will steal the sacred mask that they want so much and then the boy or girl will get chase away from his/ her village because of this act. We are definitely against this and therefore if you are this type of person, don t even bother contacting us. 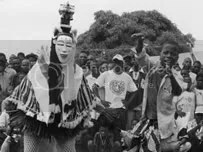 It is also important to note that in African tradition, sometimes a mask is created for a special ceremony and after the ceremony it is left alone and even given to the children to play with as the mask fulfilled its goal and it is now useless for the village. Therefore it might happen that we have such type of masks or items in our inventory.